Place butter and butterscotch chips in a medium microwave-safe bowl. Microwave on high for 30-second intervals, stirring after each, until butterscotch chips and butter are melted. Stir in marshmallow fluff and microwave mixture on high for 60 seconds. Stir mixture well to combine then gently fold in Chex™ cereal. Spray 8 x 8 inch square pan with non-stick cooking spray. Press mixture into pan. Place in refrigerator for 15 minutes to set completely. Cut into bars and serve. Looking for a quick crowd-pleasin’ dessert? 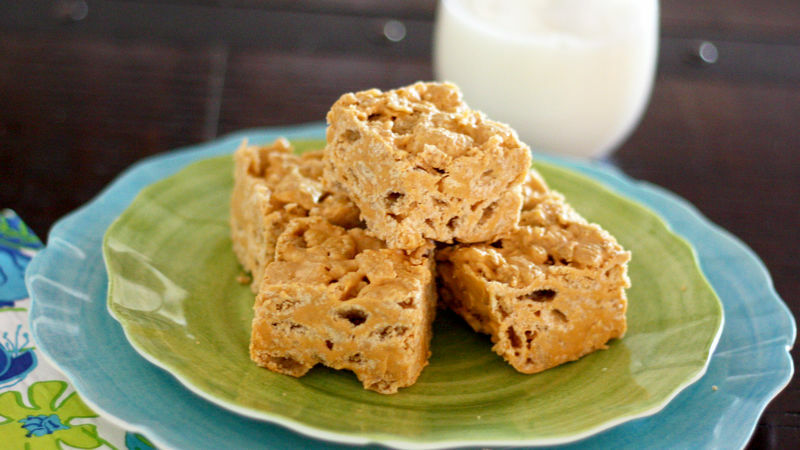 "Chex" out these wonderfully simple, no-bake, one-bowl butterscotch crispies! I LOVE making no-bake treats, especially during the lazy days of summer when I don't want to turn on the oven. They’re so easy, with endless possibilities! I recently came across these little butterscotch beauties and felt inspired. However, to steer away from peanut butter I decided to use marshmallow along with brand-new Vanilla Chex Cereal for a sweet vanilla crunch. The combination was perfect! Seriously, these couldn’t be easier…melt butterscotch chips and butter in the microwave. Add marshmallow fluff and combine. Gently stir in Vanilla Chex Cereal then press mixture into a square pan (you can also drop by teaspoonful onto wax paper if you want). Put in fridge for a few minutes to set completely and you’re ready to go! For some extra family fun, the kids and I grabbed some more Vanilla Chex Cereal and had a little “cooking class,” where everyone came up with their own combinations of no-bake flavors. The Butterscotch Crispies were the family’s favorite but we had all kinds of other fun flavor combinations (white chocolate/cranberry, anyone?!). So, for some quick and delicious family fun, grab some new Vanilla Chex and let your family’s imaginations go wild!